Your basement is the most vulnerable area of your home to flooding and you can experience basement flooding at any time of the year. 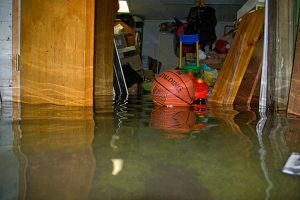 There are so many ways that flooding can start in your basement including seepage through cracks in the foundation, malfunctioning washing machines or water heaters, and sump pump overflow or failure. It is very important to always keep your basement protected from excess water because even a small leak in the foundation can lead to major issues over time. Mold growth is another major concern with flooding, especially in basements that are already more prone to mold growth than many other areas of your home. Fortunately, you can greatly reduce the risk of basement flooding in your home with a little effort on your part. Simple maintenance like finding and fixing cracks in your foundation and cleaning your gutters can help protect your basement from flooding. Installing a sump pump and keeping it maintained is perhaps the most effective way to keep water out of your basement. The following comprehensive tips will help you effectively prevent basement flooding and ensure that your sump pump doesn’t overflow or malfunction. Check your foundation inside and out for any cracks or openings. If the cracks are small, you can seal them with caulk. Extensive cracking requires help from a professional. Check the grading around your home. The ground should be sloping away from your home to prevent rain water from draining near your foundation. If the ground is not sloping away from your home, you will need to re-grade it. If your yard has drainage tiles, check their condition and replace broken tiles. If your home does not have drainage tiles, you should consider installing them. Remove all debris from your gutters to prevent them from overflowing. The downspouts must be pointed away from your foundation and carry the water no less than three feet from your home. Put window well covers over basement windows that are below grade. These covers will help keep out rain water as well as debris and animals. Check the motor by lifting the cover and pulling up the float. If the motor does not start running, make sure it is plugged in and getting power. You must call a professional if the motor still doesn’t run. Make sure the discharge line extends far enough away from your home to safely drain the water away from your foundation. It helps to have a backup power source for your sump pump in case a severe storm causes you to lose power. A backup generator will keep your sump pump running to avoid basement flooding. Look for Debris in the Basin: Various objects and debris may fall into the basin of the sump pump and damage the float mechanism that tells the pump when to drain. You can test the float mechanism by filling the basin with water to see if the sump pump starts and drains properly. It is also possible for the float mechanism to stop working on its own. Inspect Check Valve: The check valve is an important feature because it prevents the pumped-out water from coming back into the sump pump. Sometimes the check valve is not installed properly which could lead to a problem. The check valve has an arrow that should be pointing away from the sump pump when installed properly. Clean the Weep Hole: If your sump pump has a weep hole, it can be found between the check valve and the pump. Use a toothpick or something similar to clean the weep hole and don’t let it break off in the hole. Clean the Impeller: The impeller is a filter that filters debris from the water in the pump. When the filter becomes clogged, it will make a strange noise or cause the sump pump to stop running. Make sure you check and clean this filter to keep your sump pump running. 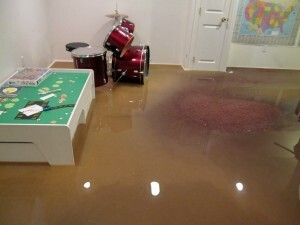 Basement flooding may be a common issue, but it is also preventable with the right actions. By effectively protecting your foundation from the outside and properly maintaining your sump pump, you can drastically reduce the risk of basement flooding in your home. If you still experience water or flooding in your basement despite your best efforts to prevent it, make sure you call the water damage restoration experts of ServiceMaster DAK right away. Our flood damage technicians use advanced equipment to remove flood water and we will also work to restore the damage and prevent mold growth.